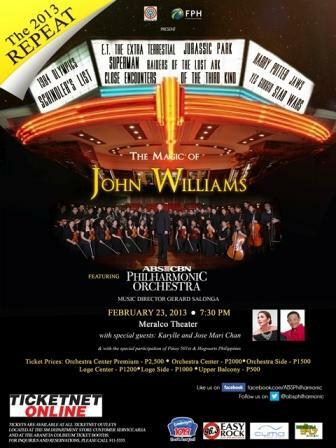 Due to popular demand, the ABS-CBN Philharmonic Orchestra will do a repeat of their concert that showcased the well-loved movie scores of legendary composer John Williams on February 23, 6 pm at the Meralco Theater. “The Magic of John Williams: The 2013 Repeat” will feature memorable themes that were heard in movies such as “E.T.,” “Star Wars,” “Jaws,” and “Superman.” Williams has lifted hearts and moved audiences to tears with these masterpieces. Other movie scores that will be included in the repertoire are themes from “Jurassic Park,” “Raiders of the Lost Ark,” “Close Encounters of the Third Kind,” “Harry Potter,” “Yes Giorgio,” plus the 1984 Olympics Anthem. Karylle and Jose Mari Chan will also perform. The Philippine Outpost 501st, an international organization of Star Wars fans who wear costumes from the movie, will also serve as an added attraction. TICKETS ARE AVAILABLE AT ALL TICKETNET OUTLETS LOCATED AT THE SM DEPARTMENT STORE CUSTOMER SERVICE AREA AND AT THE ARANETA COLISEUM TICKET BOOTHS. FOR INQUIRIES AND RESERVATIONS, PLEASE CALL 911-5555. For other inquiries, email absphilharmonic@gmail.com. For more updates, “like” facebook.com/ABSPhilharmonic and “follow” @ABSPhilharmonic on Twitter.